Accent your look and show your sense of style with our collection of men's handmade beaded necklaces, bracelets and pendants. This 9-1/2 inch bracelet can be a nice addition to your collection of beaded bracelets to give your .. This rugged-looking bracelet will add extra swag to your look. It measures 7-3/4 inches with i.. This bracelet measures 8-1/4 inches with its clock-style toggle clasp, and it consists of semi-preci.. This bracelet is made up of sodalite and wood beads and measures 8 inches with its sturdy silvertone..
We recommend adding this bracelet to your personal stash of jewelry pieces to give extra swag to you.. This 8-1/2 inch bracelet consists of wood, magnesite and hematite beads and it fastens with a clock .. This bracelet consists of carnelian, wood and red coral beads. It fastens with a cool clock to.. This men's bracelet consists of an assortment of beads like horn pipe, magnesite, wood, hematite and.. This bracelet measures 8-1/4 inches and is made up of twisted tube wood beads and splash of beige an.. 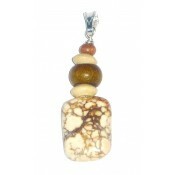 This bracelet, measuring 7-3/4 inches, consists of wood beads and jasper beads and is fastened with .. 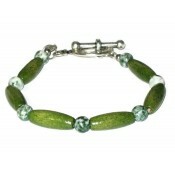 This bracelet consists of an assortment of wooden beads and is accented with a silvertone clock togg.. 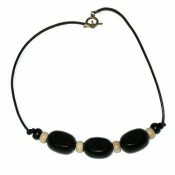 This bracelet measures 8 inches with its clock-style toggle clasp and consists of tiger eye beads .. 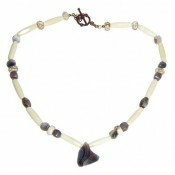 This stylish men's beaded bracelet is made up of wood beads, tree agate semi-precious stones and a.. This bracelet measures 8-1/2 inches with its silvertone clock toggle clasp, and it consists of tur..